Psychology is a subject of life, death, and in-betweens. 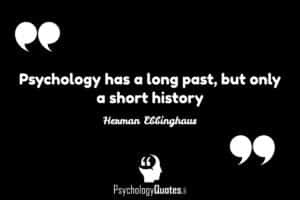 Psychology is sometimes called a new science. This is quite wrong. Psychology is, perhaps, the oldest science, and, unfortunately, in its most essential features a forgotten science. arunima das on Fame is also won at the expense of others. Shauna on Desire is the starting point of all achievement, not a hope, not a wish, but a keen pulsating desire which transcends everything.